Imagine being able to speak every language in the world? Even languages that people haven’t spoken in thousands of years. Imagine if you didn’t even have to learn these languages…you just knew them! When Maddy starts speaking Japanese her mother takes her to the doctor because she is speaking in foreign tongues, and he wants the doctor to fix her. Rather than feeling that Maddy needs to be fixed, he makes the discovery that it’s not only Japanese that she knows, but French and Spanish too. A guest spot on TV shows the world that Maddy really does know every language, and when she speaks in that language she does so with the accent of someone who was born and grew up in that country. This gift is obviously remarkable, and because of her new found talent, it’s not long until Maddy is asked on a special assignment that involves a trip to Bulgaria, where she will translate some ancient scrolls. This is where the action starts, and it involves a stowaway Ninja (Maddy's friend Kazuki), a Bulgarian wrestler, a monkey called Mr Chester, a wicked witch and a spell involving a dragon’s tongue. It seems that it’s not only the professor that wants Maddy to translate the scrolls, but a witch, and the scrolls are actually ancient spells that have been lost for centuries. One of the spells, is a ‘tongue taking spell, that leaves the victim unable to speak…and unable to understand language. Maddy and her friends have to stop the spell before everyone becomes infected and langauge will be lost forever. 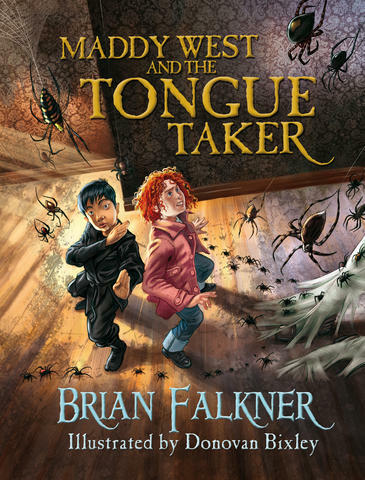 If you have trouble with spiders, as I do, you will have to get past the spider covered jacket, and be warned the spiders do make an appearance in the book , albeit briefly. I did not read Brian Falkner’s book Northwood which cam out last year (it’s on my pile), but from what I can gather if you enjoyed Northwood, this book is very much in the same vein, even the physical size of the book and the fact that there are lovely illustrations to be found throughout.